1 Peter 5:7 is likely inspired by Psalm 55:22 – Cast your cares on the Lord and he will sustain you; he will never let the righteous be shaken. Or perhaps it’s fairer to say that 1 Peter 5:7 is Peter’s simplification of David’s Psalm 55:22. 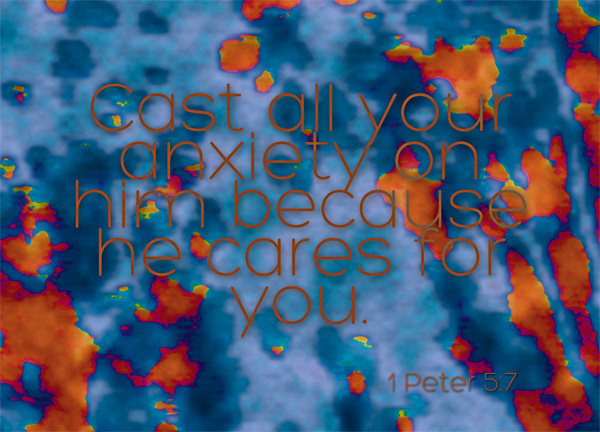 There are plenty of reasons why we should cast all our anxieties onto the Lord; there are numerous reasons why we can cast all our anxieties onto the Lord, and many of these reasons are linked to one another and can be traced back to the omnipotency of God – but Peter simplifies it for us. Because God cares for us. Because God loves us. Sometimes, sometimes, we don’t need to think too far. Sometimes, we don’t need to dig too deeply into the matter. Sometimes, all it takes is for us to know that God cares for us. That reason alone is sufficient for us to rely on God. Cast all your anxiety on him – Humanity as a race has to deal with a lot more concerns than the animals of the wild, who by and large only need to worry about survival. Well, in essence, all our worries can be traced back to survival, but I don’t think many would argue with me if I say that we have a lot more concerns – a lot more cause for anxieties than the wild. It is natural – it is human instinct to worry. Jesus famously preached in Matthew 6 that we shouldn’t worry, because we have God – Look at the birds of the air; they do not sow or reap or store away in barns, and yet your heavenly Father feeds them. Are you not much more valuable than they? [Matthew 6:26|Article]. Indeed, while we are powerless, and there’s no point to worrying precisely because we’re powerless and worrying won’t change a thing – Can any one of you by worrying add a single hour to your life? [Matthew 6:27|Article]. Jesus preached that, but we still worry, because it’s human nature. We can’t stop worrying – all we can do is perhaps, worry less. We will still worry, even as we try our best not to. But the crucial thing is, when we worry, and when we find ourselves worrying, we ought to cast these worries onto the Lord. Immediately. Sometimes we worry without realizing that we are worrying – it’s instinctive after all. We don’t sit down and decide that, okay, it’s time to worry about my family – and then we start to worry. No, the flow of our thoughts and the trajectory of the train of worries that are carried around in our minds are often out of our own control. Yet, while we probably can’t completely prevent ourselves from worrying, we can reduce our worrying and reduce the time we spent on each worry. When we realize we are worrying about something, let’s learn to lift it up to God immediately. When it suddenly occur to us that we are fretting, let us cast these anxieties to God immediately. Eventually, we will find ourselves worrying lesser and lesser, and spending lesser and lesser time on worrying. Indeed, while we cannot change anything by worrying, we can change ourselves by spending the time on worrying on other things. In a parallel passage to Matthew 6:25-34 on worrying, Jesus said, Since you cannot do this very little thing, why do you worry about the rest? [Luke 12:26]. Indeed, often what we worry about are the things that are beyond our control. We don’t usually worry about things that we are confident about and in control of. because he cares for you – and here is the crux of this verse – because God cares. Because God loves us. Firstly what is the extent of God’s love and concern for us? Great is the extent, and we’re famously told – For God so loved the world that he gave his one and only Son, that whoever believes in him shall not perish but have eternal life [John 3:16]. From that verse alone we see so many things – but mainly we see the extent of God’s love for us – so much so that he sacrificed his only son for us; so much so that he was willing to forgive the world of our enormous and numerous sins against him. Do not doubt the quality of God’s love for us. Do not doubt the extent of God’s love for us. We’re not told that God seems to care for us. We’re not told that Peter thinks that God cares for us. God cares for us – period. But so what if God cares for us? My friend from school may care for me too, but that doesn’t mean that I am freed from my worries. To make sense out of the consequences of the fact that God cares for us, we need to first understand the qualities of God. He is omnipotent – almighty and great. He has every might to settle things for us. He has every right to settle things for us. He is able and capable of helping us out when we’re lost and stranded. And because he is omnipotent, he is trustworthy – Commit your way to the LORD; trust in him and he will do this [Psalm 37:5]. If God was merely omnipotent, but doesn’t care about us, then it has nothing to do about our worries – we have nowhere to cast our worries upon. And if God cares for us but isn’t omnipotent, then while we can cast our worries onto him, it would mean nothing because he isn’t able to do anything for us. But our God not only cares for us, he is also omnipotent and able. Because of these two qualities of his, we can trust him, we can lift our worries to him, and we can be freed of our worries. Of course, casting our worries onto God doesn’t mean that we will get instant deliverance from the issues that we are worried about. It does mean deliverance from our worries though – by casting our anxieties onto the Lord, we are thus freed from our worries. While God cares for us, and while God is all-powerful, it doesn’t mean that it is always in his will to give us the easiest way out or to give us what we want in the way that we expected. Sure, he will probably still give us what we want – but perhaps not as quickly as we expected, and sometimes, not in the way we anticipated. Even so, God will make a way, because he cares. And because he cares, we really don’t have to worry about the things that we are worrying about. Instead, let us learn to cast our worries onto him and depend on him.